Remodeling a home in Boston? Find an UltraCraft dealer near you! UltraCraft is the premier manufacturer of full-access custom cabinetry in the USA. Our American-made cabinetry can suit any style – contemporary, transitional, traditional and anything in between. Peter and his team have been fulfilling dreams for clients for 30 years! Old school craftsmanship building quality cabinetry, hand made furniture & high-end renovations. Always using the finest wood. What do you get when you combine a background in art, engineering, and psychology? You get Mark Carrig and my keen, unparalleled sense of vision and true passion. I take pride in my ability to fully understand my client’s needs, find the appropriate products, and see the job to completion. 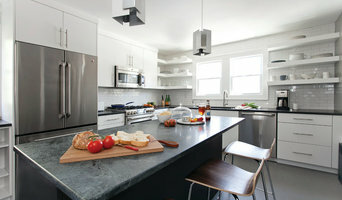 I take full responsibility for the design, pricing, ordering, and delivery coordination of the cabinetry and counters. If there's a problem, I'm the one to contact and you can trust that I will take care of it! In addition, I am responsible for several crews of qualified, experienced, and insured cabinet installers. With my expertise coupled with your inspirations and dreams, we will create a kitchen that reflects you. We will create a kitchen that will become the heart of your home. Why Choose Carrig Kitchens, LLC? The process starts with listening to your desires and measuring your space and doesn't end until the cabinets are delivered on time and the pictures of the end result are taken. The mobile showroom literally brings hundreds of design combinations to your house so you can see what each design will look like in your home, not in a warehouse. There is never any question of who is going to measure and be responsible for the kitchen fitting. I offer the most creative and innovative solutions to suit your budget and all your kitchen design challenges. IMAGINED IN THE CLOUDS. MADE IN THE U.S.A. Mobi gets its roots from Detail Woodworking, where the custom cabinetry business has been booming for over 25 years. With this firm foundation established, the team decided it was time for reinvention: to simplify, modernize, and evolve with a more holistic approach. We take every component of a space into account when creating your cabinets, designing in a way that transforms your kitchen into a living area — a place where functionality, comfort, and entertainment come together flawlessly. DESIGNED TO DEFINE OUR TIME. BUILT TO OUTLAST IT. Everything is made on site by our dedicated team, utilizing top of the line technology and proudly made in the USA. We wanted to create something brand new in the industry, something that could change the way we see cabinetry. The vision was modern and elegant, featuring simplicity and organization down to every last detail. What made Mobi so special was this idea to streamline the entire cabinet making process, from the client’s choices through the cabinet production. We have simplified a rather complicated experience to make it easier for our clients to get exactly what they want in a systematic manner. The idea included creating an extremely high quality product that exemplified our dedication to design and trend, one that was modern yet customizable — and thus, Mobi was born: Modern, Out of the Box Ideas, a standout in the custom cabinetry world. Join us in taking things to the next level in this industry. LIVE LIFE SQUARED. Mark Del Guidice Furniture has been building custom woodwork for over 30 years. It is attention to detail and good craft practices that has earned us the recognition as one of the best in the Boston area. We design and build custom furniture and cabinets in many styles and materials at reasonable prices . Both free standing and built in pieces for home and office. * In addition, Mark has been designing and building his own unique contemporary style of furniture for which he has won awards and national attention. We are a family owned and operated custom cabinet shop that strives for perfection in designing, building, and installing the perfect kitchen, bathroom, library, or any other unique and custom cabinets in your home. The Cronin family has served New England area since 1962 - building top quality hand-crafted cabinets and millwork. Our work is unconditionally quarantined and carefully installed by us to maintain our superior quality. Headed by Jack and Mary Cronin, this family-operated business has been building quality cabinets and prides itself on being available to their customers during every step of the design process; from initial consultation to the cabinetry’s installation. Standing one-hundred percent behind each and every piece. When you think about cabinets, your mind probably goes straight to kitchens and bathrooms. But Boston cabinetry professionals’ abilities extend far beyond those obvious spaces. If you need built-in storage, shelving or custom case goods, no matter what the room or purpose, cabinetry experts can help. Their focus on details and space-planning skills can help you squeeze functionality from even the tiniest corners of your Boston, MA home. In addition, Boston, MA cabinetry pros can help you give worn or dated cabinets a makeover. They can replace doors; add glass inserts, decorative moldings and other details; or give cabinetry a new coat of paint or specialty finish. Your cabinetry professional might work closely with a Massachusetts kitchen designer, builder, remodeling contractor or interior designer. Here are some related professionals and vendors to complement the work of cabinets & cabinetry: Kitchen & Bath Designers, Kitchen & Bath Remodelers, Interior Designers & Decorators, Closet Designers and Professional Organizers, Woodworkers & Carpenters. Find a cabinetry professional on Houzz. Narrow your search in the Professionals section of the website to Boston, MA cabinets and cabinetry. You may also look through Massachusetts photos to find examples of cabinets that you like, then contact the cabinetry professional who worked on them.